For the second part of the Tate Island Experience, I'm still in my freighting caboose waiting out a March blizzard on Reindeer Lake. I just finished having pancake breakfast and starting my fourth cup of coffee and the storm is calming down a bit. So here is where we ended of in the last Cat Train Newsletter. 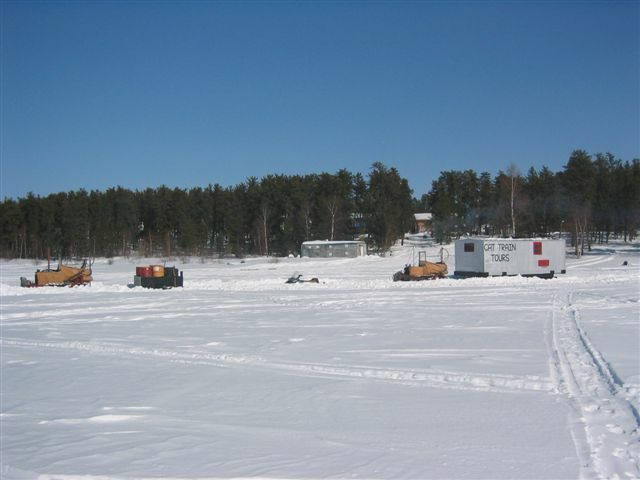 The plan now is to get the lumber to the lodge and get the broken D6 9U known as "THE HOOD" off of the frozen lake, plus get Jim, the lodge owner off to the sportsman show in the USA. I figure it would be more relaxing for him to be at the show selling fishing trips than worry about the lumber, the broken cat and freezing his tushie off too! So Jim, the lodge owner headed South to relax but also picks up the check for the swamp buggy because I was able to sell it for him. I figured it was the least I could do for the fellow, plus I don't want to pull the swamp buggy off the lake again next year. There are just some "Southern things" that should stay in the South. Buddy Barry is to lowbed the the 2 TD-6's and the fuel skid to Kinoosao, Sk. So to load the little TD-6s I use a fancy IT-28G Caterpillar loader and just pick them up and load them. A lot easier than trying to get the little cats to climb up on the deck of the trailer and turned to fit. 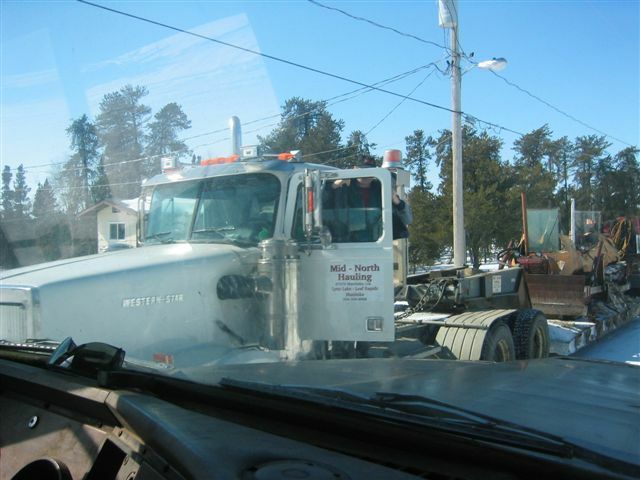 I'll be taking the winter freighting caboose on the Linn Tractor trailer behind my Ford Dually (1974 ford semi tractor unit we use as a one ton truck). On Saturday morning, we try and have a 2 car parade with buddy Barry and the 2 semis but that didn't work out. Buddy Barry was going one way looking for us and we were going the other way looking for him. The joys of the Great White North is all you have to do is stop and ask anyone and they will tell you which way the other semi went. We arrive in Kinoosao, Sk to find buddy Barry has just arrived with the "big load" of small cats and is unchained and ready to unload them. Since the town of Kinoosao, Sk is very small and they don't plow much snow due to the lack of heavy equipment, we unloaded the cats on the snow in someone's front yard. Plus we loaded the swamp buggy on buddy Barry's semi trailer in someone else's front yard, didn't want any one to feel left out. When I was pushing the swamp buggy on the semi trailer, the TD-6 known as KOMMUNIST KAT developed a very strong smell of burnt electrical wiring. I just turned the main master switch off and continued loading to get buddy Barry back to Lynn Lake, Mb to meet the Southern lowbed which is coming for the swamp buggy. After buddy Barry leaves I check the problem out to find that the stupid starter has engaged itself and slowly burnt out. Oh well, I just have to push start the "KOMMUNIST KAT" to get him going in the morning. Southern Belle gets to drive the TD-6 known as "CURSE OF REVERSE" pulling the winter freighting caboose with Xena waving out the window at all the people who are watching us leave Kinoosao, Sk. I'm driving the TD-6 known as "KOMMUNIST KAT" pulling the fuel skid and leading the way to the broken D6 9U known as "THE HOOD". Southern Belle is "man handling" the TD-6 very well for the first time on a cat, everything is going well, until we get to the broken cat known as "THE HOOD". 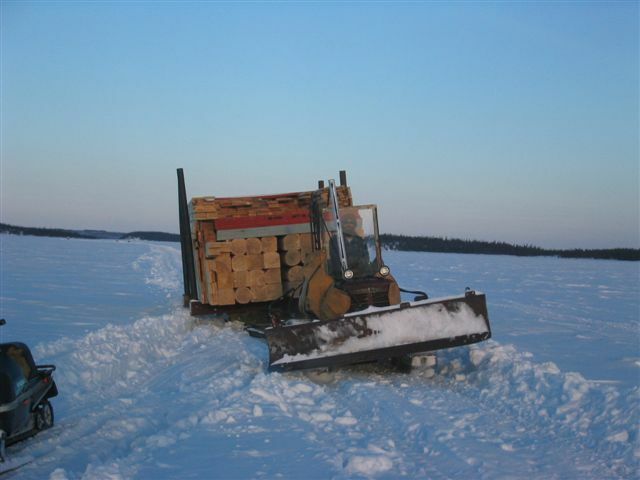 As I was trying to get the cat and the fuel skid close to "THE HOOD" so I would not have to carry all the tools and equipment through all that deep snow, problems arose. The right steering clutch on the "KOMMUNIST KAT" decides to malfunction, this is not good because I was not sure what was happening. Next thing I know, I'm up against "THE HOOD" with the blade of the "KOMMUNIST KAT" and I can't back up due to the fuel skid and only power to one track. So here I'm sitting on a cat, that I have just fixed the steering clutches and final drive, on the side that has just malfunctioned, jammed up against another cat that has the exact same problem! Plus, the fact that I'm on the biggest body of frozen water sitting in a southern traffic jam, bumper to bumper with no place to go. Oh well, I chose this life style in the Great White North and I will make the best of it! At least there is no one around to see this slight oops. I was able to get "THE HOOD" started and moved out of the way so I could park the "KOMMUNIST KAT" on the area cleaned of snow. Next I hook the small little cat "CURSE OF REVERSE" to the loaded sleigh of lumber and go to move it. This was "a dream" to try and move a sleigh weighing in, at over 32 000 lbs with a cat weighing 8 000 lbs so I had to break it loose with "THE HOOD" which only had power to one track. Size make a difference and I think that this winter of snow is beyond what these little TD-6s are capable of. Next I have to plow most of the snow off the trail I made with "THE HOOD", so the "world's smallest cat" can pull the "heaviest load" which was easy for the big cat known as "THE HOOD" to pull. Now I have to learn how to work a cat with an angle blade on it because everything I have done in the past is with a vee plow! So off I go dragging a southern stone boat with a small farm tractor, trying to plow out the trail so the heavier sleighs can be pulled with ease. This stone boat is like trying to pull 30 tonnes of cement block on dirt ground, what a poor design for the Great White North! So after about 1 km, I realized that with the stone boat behind the cat, I can't plow and pull at the same time. Also, with the angle blade it would catch the hard snow drifts and make the cat turn an immediate left turn! Then one has to back up to get pointed in the right direction. Once I unhooked the stone boat and went ahead and back again about 10 kms plowing the snow, the little cat could pull the stone boat on the trail that was made with not too much trouble. So that is what I ended up doing, pulling a sleigh ahead, then going back plowing the trail better for the next heavy sleigh. I did this in stages but always keeping everything together in case of a snow storm that could blow in the trail that had just been plowed. So here we are in the winter freighting caboose waiting out a March snow storm so I can plow out the last 10 kms to Tate Island Lodge to get the freight delivered. This has been the longest freight haul ever but the story and pictures are well worth it.